Yesterday, I was feeling a bit down about my 1979 Jeep Cherokee Golden Eagle after discovering that its engine is basically shot. But today I’m all cheered up, because my friend Jamie reminded me of what my Golden Eagle is not: a totally rotted out shitbox. Seriously, just looking at these pictures of a first-gen Toyota Tacoma made me dry heave. Go ahead and save this post in your bookmarks, because when your short, easy project becomes a long, arduous one like mine did, you’re going to want something to remind you of how good you have it. (That is, unless you’ve got a vehicle that’s been deeply, deeply structurally compromised). It honestly looks pretty decent in these grainy photos. The paint still has some shine to it, the body panels look reasonably straight, and there doesn’t seem to be much sagging going on in the suspension. But this thing is far from decent, because underneath, it’s hiding some dark, dark secrets. Just look at that top photo and the one below showing how a crossmember meant to hold up the exhaust has just rotted out of the frame, and is now dangling. Toyota has a bit of a history with Tacoma frame rot issues, even issuing a multi-billion dollar recall in 2016 on some Tundras, Tacomas, and Sequoias. So even though it’s not surprising to see a crusty Taco frame, it’s still shocking to see what a seemingly fine-looking truck can be hiding underneath its shiny body panels. Like, what is that shock absorber mounting to? And that front leaf spring mount: What’s it doing? How did this thing even drive down the road? 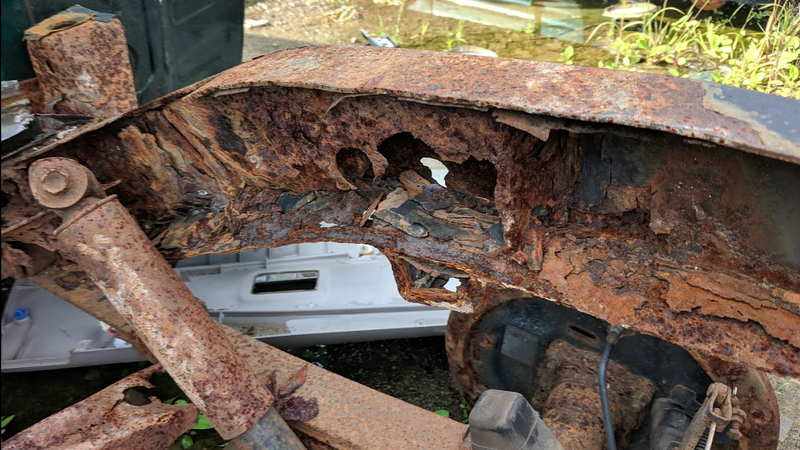 Some of the damage shown could have been caused by junykard-dwellers, but that deep, crusty Fe2O3 is a product of only one thing: road salt. And my god has it wreaked havoc on this poor, poor Taco. Thank goodness it’s in a junkyard, and not being sold to some unsuspecting soul too lazy to look underneath.